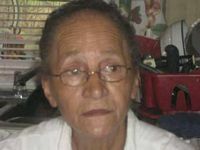 Mrs. Sylina “Happy” Locklear, 77, of 127 Peach Drive Pembroke NC, was born on December 27, 1939. She departed her life at her home on September 18, 2017 and went to be with the Lord. She was preceded in death by her mother: Mrs. Elizabeth Oxendine; father: Mr. Dannie Oxendine; three brothers: Mr. Julius “Buck” Oxendine, Mr. Bill Locklear and Mr. Hervey Oxendine; one sister: Ms. Betty Dial. The funeral will be 3:00 p.m. Sunday, Sept 24, 2017, at St. Anna Freewill Baptist Church with Rev. Lacy Lambert officiating. Burial will follow in the St. Anna Church Cemetery. Mrs. Sylina was a devoted wife, mother, and grandmother. She was a great friend to all. She loved to cook and feed anyone that was in her home. Everyone was always welcomed around her eating table. Granny took care of people she did not even know. She would never let anyone go without. She loved to see all her family and friends coming by any time or day of the week, but she especially loved to have them all by on Sundays or at every family gathering. She leaves to cherish her memories to her husband: Mr. Gerald Locklear of the home; two sons: Mr. Horace Oxendine of the home and Mr. Kenneth Oxendine of Rowland; two daughters: Mrs. Kathleen Locklear (Jimmy) of Rowland and Ms. Shirlene Emanuel of Pembroke; two sisters: Mrs. Alene Jacobs (Belton) and Ms. Flora Dial of Pembroke; six grandchildren: Sylina Kay, Horace Jr., Jessica Lynn, Trevin, Heather and Horace III “Papa”; ten great-grandchildren: Kendick; Branlon, Kensley, Tehya, Aiden, Jayla, Ganiya, Braylon “Papie” Peyton, and Halaya; and one great-great-grandchild Kenlee and a host of relatives and friends. A special thanks to Ms. Tina Oxendine for 12 years of service with her in her home. The family will receive friends from 7-9 p.m. Saturday, September 23, 2017 at Locklear and Son Funeral Home.